Jonathan Roy Broxton (born June 16, 1984) is an American professional baseball relief pitcher for the St. Louis Cardinals of Major League Baseball (MLB). He previously played for the Los Angeles Dodgers, Kansas City Royals, Cincinnati Reds, and Milwaukee Brewers. Broxton attended Burke County High School in Waynesboro, Georgia. As a senior for the Bears, he posted a 9–2 record and a 1.21 earned run average as a pitcher. He was drafted by the Los Angeles Dodgers in the second round in 2002 and signed with them on June 30, 2002. In the minor leagues, from 2002 to 2006, Broxton was 23–11 with 12 saves and a 3.03 ERA in 303 innings. He struck out 332 batters, while walking 115 and giving up 244 hits. His minor league teams were the Great Falls Dodgers of the Pioneer League, the South Georgia Waves of the South Atlantic League, the Vero Beach Dodgers of the Florida State League, and the "AA" Jacksonville Suns of the Southern League. Broxton made his big league debut on July 29, 2005 against the St. Louis Cardinals, pitching one inning in relief, allowing one run, and striking out two. His first strikeout victim was Cardinals Albert Pujols. During the 2005 campaign, he appeared in 14 games, all in relief, striking out 22 batters in only 13 and two-third innings. Broxton pitching during spring training in Arizona in 2008. 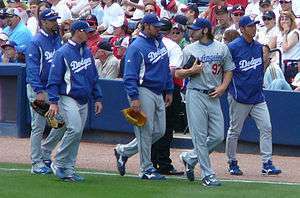 Broxton (center) with fellow Dodgers pitchers Esteban Loaiza, Scott Proctor, Joe Beimel and Takashi Saito in 2008. Broxton began the 2006 season with the Dodgers Triple-A affiliate, the Las Vegas 51s. After allowing no runs in 11 appearances (with 18 strikeouts), on May 1, 2006, Broxton was recalled from the minors after the demotion of veteran Lance Carter. After gradually gaining the confidence of manager Grady Little, Broxton became Takashi Saito's primary setup man, and the team's backup closer. He held batters to a .159 Batting average with runners in scoring position, and held right-handed batters to a .196 batting average. He appeared in a career high 83 games for the Dodgers, third most in the National League and fourth most in franchise history. He threw 99 strikeouts (second most among all big league relievers) and ranked fifth in the Majors with 32 holds. His 2.85 ERA placed him as one of nine Major League pitchers with more than 75 innings pitched and an era below 3.78. Broxton recorded 96 2⁄3 consecutive no-home run innings from July 23, 2006 to August 21, 2007. That was the longest streak in team history since the Dodgers moved to Los Angeles in 1958. On July 19, 2008, Saito was placed on the disabled list (DL), and Broxton inherited the closer role for the remainder of the season. He allowed a pinch hit two run homer to Matt Stairs of the Philadelphia Phillies in the 8th inning of Game 4 of the 2008 NLCS. Broxton closes out a game versus the Pittsburgh Pirates in his first full season as closer. In his first season as the full-time closer for the Dodgers, Broxton was selected to the National League All-Star team. However, he was unable to play in the Game due to injury. His final regular season record was 7–2 with a 2.61 ERA, 36 saves and 114 strikeouts. Despite his accomplished season, he suffered a costly blown save in Game 4 of the 2009 National League Championship Series against the Philadelphia Phillies when he walked Matt Stairs, hit Carlos Ruiz with a pitch and then allowed a two out/two run walk off hit by Jimmy Rollins. Broxton had an excellent first half of the season and was selected to the 2010 Major League Baseball All-Star Game, in which he recorded the save. However, he faded in the second half, beginning with a blown save against the New York Yankees in which he threw 48 pitches and allowed 4 runs on 4 hits and 2 walks. In somewhat of a repeat performance against the Phillies, he blew another 4-run lead on August 12, as this time it was Carlos Ruiz delivering the 2-run walk-off hit. He was replaced as the closer at the end of the season by Hong-Chih Kuo. He was nicknamed by fans the "Fat Hobo." Broxton returned to the closer role at the start of the 2011 season and appeared in 14 games in March and April, with a 5.68 ERA and 7 saves. On May 4, he admitted that he had been feeling some pain in his elbow and he was placed on the disabled list. After a couple of months off he made two rehab appearances with the AAA Albuquerque Isotopes on June 21 and 23 but felt tightness in his shoulder when throwing on June 25 and was shut down again. He had hoped to return in September but Manager Don Mattingly said that it would be late if he returned, if at all. He had another setback after testing his elbow off a mound in September and was shut down for the season. He became a free agent at the conclusion of the season. On November 29, 2011, Broxton signed a one-year, $4 million contract with the Kansas City Royals. On April 11, 2012, Broxton tied a dubious record for a major-league pitcher by ending and losing a game on consecutive hits by pitch (HBP). The last time this happened was on September 2, 1966, when Stu Miller of the Baltimore Orioles hit Al Weis and Tommie Agee of the Chicago White Sox. Overall, Broxton had a strong first half, posting a 2.05 ERA, with 20 saves in 23 save opportunities through July 1. On the July 31, 2012 MLB non-waiver Trade Deadline Broxton was dealt to the Cincinnati Reds in exchange for minor league pitchers J. C. Sulbaran and Donnie Joseph. On November 28, 2012, Broxton agreed to terms on a multi-year extension with the Reds. He was placed on the 15-day disabled list on June 15, 2013 due to a right elbow flexor strain. He was placed on the DL again in August. After closer Aroldis Chapman was hit in the head with a line drive on March 19, Broxton took over the closer duties for the Reds to start the 2014 season. On August 31, 2014, Broxton was traded to the Milwaukee Brewers for two players to be named later. On September 10, the Brewers agreed to send Kevin Shackelford and Barrett Astin to the Reds to complete the trade. On July 31, 2015, Broxton was traded to the St. Louis Cardinals in exchange for minor league outfielder Malik Collymore. The Brewers also sent cash, as the pitcher's 2015 salary was $9 million ($9,011,386.0 today), and he would have been arbitration eligible in 2016 with a $2 million ($2,002,530.2 today) buyout. Broxton made his Cardinals debut on August 1 in a 6–2 loss to the Colorado Rockies, pitching one scoreless inning, and allowing no runners to reach base. He completed 24 innings, striking out 26 with 12 walks and a 2.66 ERA. The Cardinals declined the $9 million option after the season, buying it out for $2 million and making him a free agent. On December 10, 2015, the Cardinals re-signed Broxton to a two-year contract worth $7.5 million. He started the season with a 2.25 ERA through May 19, but after allowing five earned runs while recording one out against the Arizona Diamondbacks on May 20, his ERA jumped to 4.96. As a result, infielder Rubén Tejada made his major league pitching debut in the ninth inning of that game. Broxton was a member of the United States team in the 2009 World Baseball Classic during March 2009. The 6 ft 4 in (1.93 m), 305 lb (138 kg) Broxton features a mid-90s fastball as well as a slider. His fastball velocity is down from his early years – it topped out at 102 mph in 2009 MLB season. Broxton and his wife, Elizabeth, married in January 2006. The couple had their first child, a son named Jonathan Brooks, on June 11, 2009. ↑ "Jonathan Broxton Statistics". Baseball-Reference.com. Retrieved 2007-09-15. ↑ Gurnick, Ken (2006-05-01). "Notes: Carter gets sent down". MLB.com. Retrieved 2009-06-13. ↑ "Los Angeles Dodgers vs. Philadelphia Phillies – Recap – August 23, 2007". ESPN.com. Retrieved 2009-06-13. ↑ "October 13, 2008 National League Championship Series (NLCS) Game 4, Phillies at Dodgers". Baseball-Reference.com. Retrieved 2009-06-13. ↑ "Jonathan Broxton finally admits to elbow pain, is shut down -- and there's no closer in waiting [Updated]". 4 May 2011. ↑ "L.A. on Navarro: 'Philosophical Differences". ↑ "Are Juan Uribe and Jonathan Broxton done?". 30 August 2011. ↑ "Broxton suffers setback, likely done for season". 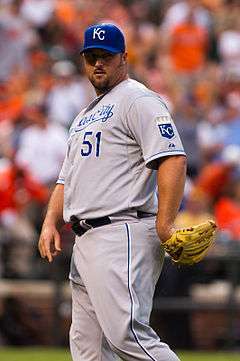 ↑ "Jonathan Broxton signs one-year deal with Kansas City". yahoo.com. Retrieved 2011-11-29. ↑ "Jonathan Broxton becomes first pitcher in 46 years to hit two batters to end a game". ↑ "September 2, 1966 Baltimore Orioles at Chicago White Sox Play by Play and Box Score - Baseball-Reference.com". ↑ Sheldon, Mark. "Broxton deal, moves". mlb.com. Retrieved 31 July 2012. ↑ "Brewers acquire Broxton from Reds for 2 players". ESPN.com. Associated Press. August 31, 2014. Retrieved August 31, 2014. ↑ "Reds get two pitchers to cap Broxton trade". ↑ Gitlin, Marty (July 31, 2015). "Brewers dispatch RP Jonathan Broxton to Cardinals". CBS Sports. Retrieved July 31, 2015. ↑ Hardricourt, Tom (July 31, 2015). "Brewers trade Jonathan Broxton to Cards for outfielder". Milwaukee Journal Sentinel. Retrieved July 31, 2015. ↑ "Arenado homers as Rockies beat Cardinals 6–2". FOX Sports. Associated Press. August 1, 2015. Retrieved August 2, 2015. ↑ Gleeman, Aaron (November 2, 2015). "Cardinals keep Jaime Garcia for 2016, drop Jonathan Broxton's option". NBC Sports. Retrieved November 6, 2015. ↑ KMOX News Release (December 10, 2015). "Cardinals sign free-agent pitcher Jonathan Broxton". KMOX. Retrieved December 10, 2015. ↑ Hummel, Rick (May 22, 2016). "Cardinals notes: Diaz finally finding his stride at shortstop". St. Louis Post-Dispatch. Retrieved May 22, 2016. ↑ "PITCHf/x Player Card". BrooksBaseball.net. Retrieved Nov 3, 2015. ↑ "FanGraphs Pitch FX". Fangraphs.com. Retrieved 2015-11-03. ↑ Youmans, Matt (2006-04-30). "'Silent killer' Broxton lets pitches make all the noise". Las Vegas Review-Journal. Retrieved 2009-12-14. ↑ "The Official Site of The Los Angeles Dodgers: Team: Player Information: Biography and Career Highlights". MLB.com. Retrieved 2007-09-15. ↑ Paulling, Daniel (2009-06-14). "Now a dad, Broxton back with Dodgers". MLB.com. Retrieved 2009-12-14. ↑ Hernandez, Dylan (2009-06-13). "Andruw Jones says he left because of Frank McCourt". Los Angeles Times. Retrieved 2009-12-14. Wikimedia Commons has media related to Jonathan Broxton.